New home on the Thames for QE2? Home/Cruise News/New home on the Thames for QE2? As fears grow once again for the future of the fabled liner Queen Elizabeth 2, a group of investors has made a New Year resolution to bring the ship back to the UK. A team called QE2London wants to moor the ship in the Thames and claims to have raised £20m to convert it for use as a hotel and conference centre. 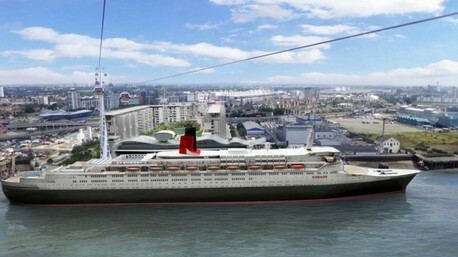 The Clyde-built former former Cunard liner was retired in 2008 and sold to Dubai for £64 million; the new owners’ plans to turn it into a hotel are no nearer fruition than they have ever been and the only time it has welcomed guests was for a New Year party 12 months ago. The ship has lain idle ever since, with a skeleton crew on board to maintain engines and air-conditioning in working order. Shortly before Christmas the crew was replaced by a team from China, leading to speculation the vessel was about to be towed to a scrap yard in the Far East. While some would prefer QE2 – launched in 1967 – to be cut up and recycled, the QE2London team has identified a site beneath the Emirates cable car which crosses from north Greenwich to the Royal Docks and in a line between the O2 Arena and the ExCel Centre. Of its 950 cabins, fewer than 600 would be upgraded to provide accommodation. Much of Deck 5 would be converted into a reception area and museum. A spokesman for the Port of London Authority said that although QE2 would be able to negotiate the Thames Barrier, it was very unlikely it could be brought into London without fully operational engines, thrusters and rudders. He added that extensive dredging would be needed to provide a berth. Prominent campaigner Rob Lightbody of The QE2 Story admitted: “She can definitely get there, but only at high tide and with careful planning. She would never have been able to do it when in service. This would be a one-way trip. That would be great – QE2 back in UK. If too difficult in the Thames why not Southampton her home port? Would be a great tourist attraction for the city. Problem is Southampton has a Labour council with no brains or vision. I’m sure the people behind this have already ensured that the mooring in the Thames will be suitable. Southampton is not suitable for a number of reasons. The main thing is that she has to get back to the UK and it seems there is a race against time to do this before she’s scrapped and turned into razor blades. A most undignified way for any ship to go, let alone a Queen! There is an online petition on the UK Gov website for anyone wishing to save the QE2. I’ve signed it, I would beg anyone else interested in saving her to do so too. Good luck in bringing this magnificent liner back home. We have been on the Q.E.2 a few times and are avid collectors of all things Q.E.2 so much so it has taken over our conservatory (lol). As my husband and I come from Glasgow we saw her being built on the Clyde and what a site she was. It would be great to have the opportunity to visit her again and to walk on the deck once more, this would bring back so many memories of captains cocktails with Captain Ian Mc Naught or the experience of being on her whilst she celebrated her 40th anniversary going around Great Britain. please bring her home to the UK, this is where she belongs. people would book just to be on her, if she was in her original colours. Cunard betrayed her after she had given them a turning point in there business over so many years loyal service and remained so true to them, sham on Cunard. Now its time for Cunard to support QE2 in her need as she has suported them and bring her home, Now! please god let this suceed let her come home.